Most older adults believe a person’s hearing and quality of life are strongly connected, and many believe their hearing could be better. Yet, comparatively few older adults actually confront the issue, according to a new AARP survey. But it’s really important that we all take action and not be passive when it comes to hearing loss. An overwhelming majority of survey respondents (94 percent) said they consider hearing health and hearing loss to be an important concern among adults age 50 and older, and 84 percent of survey respondents said their own hearing loss was an important concern. But almost half of survey respondents (47 percent) acknowledge that their hearing could be better, but they haven’t sought treatment. The disconnect between the high value placed on hearing and what people are doing about it surfaced in responses to many survey questions. Most respondents agreed that maintaining hearing health is either extremely or very important to their quality of life, and more than half of respondents (52 percent) worry that insufficient attention is paid to getting regular hearing check-ups. In addition, a full 84 percent of respondents agreed that they would be likely to seek treatment for hearing loss if it improved their quality of life. But only 1 in 4 respondents said they had a hearing test in the past five years. That’s lower than the number of respondents (32 percent) who had been to a dermatologist in the past five years. While a majority of people surveyed acknowledge hearing’s importance, they tend to prioritize other forms of health. More than two-thirds (68 percent) of respondents reported having no discussions about hearing health with medical professionals, including primary care doctors, audiologists or hearing instrument specialists. Moreover, fewer than 1 in 10 respondents currently own a hearing aid (8 percent) or use other assistive technologies (2 percent) — despite 1 in 3 respondents (34 percent) saying they have difficulty hearing when there is noise in the background, and approximately 1 in 4 respondents (23 percent) reporting they have to sometimes strain to understand a conversation. Most respondents (74 percent) who knew someone with hearing loss said it’s not very or not at all difficult to discuss hearing loss with that person, and more than three-quarters of respondents said they would get a hearing check-up if they thought they had an issue with their hearing health. Health insurance doesn’t sufficiently cover treatment cost (27 percent). Minor hearing issues are easy enough to live with untreated (24 percent). Treating hearing issues would cost too much (22 percent). Notably, 41 percent of respondents said none of the reasons the survey listed would prevent them from getting help for a hearing issue. If they were to seek help, 2 in 3 survey respondents said finding a professional with a high level of expertise on hearing would be critical. Take Action: If you’re ready to take the first step, visit the AARP Hearing Center (www.aarp.org/hearingcenter). 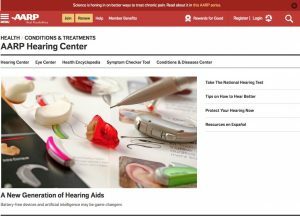 Our AARP Hearing Center page is a great resource of helpful information on a variety of hearing-related topics. Plus, you or your loved one can take the National Hearing Test for free, as a first step. Don’t be passive, take the steps to make sure your hearing is pitch perfect!